Millions of Indian Christians are facing being beaten, attacked, or even killed. Because of the way they choose to worship, pray, and believe in God. So, let me explain the situation, and 7 critical steps that can help stop this assault on religious freedom. Today in India, the largest nation in the world, and the largest democracy, there is a crisis of violence and mass violation of human rights that is being ignored by the press and the media. It is also being deliberately ignored by the Indian government, which claims to be “secular” and in theory, is supposed to support religious freedom. Although there are people within the Indian government who want to take an active stance against persecution, there are very powerful factions that are complicit with the violence. The dominating political party in the government is called the Bharatiya Janata Party (BJP), which believes that India should be united under a single religion, language (Hindi), and culture- Hinduism. The Radical Hindu Nationalists who are perpetrating these attacks of violence are rooted in this belief system as well. President Donald Trump has incredible influence and power on the world economic and political scene. If he takes action against persecution of Christians in India, the situation is likely to shift, protecting the lives of millions. Speak out for the persecuted. President Trump has oral persuasion and clout. Leaders and government authorities do not want to rub him the wrong way. The first thing President Trump must do to stop the persecution in India is to take a strong stance and become a voice for the voiceless by speaking out in his tweets and talks. The Indian government has turned a blind eye to the crisis of persecution—for now. But, what could happen if the United States- a global economic and political force that carries more influence than any other nation in the world- spoke out when the Indian government is not? Demand Christian organizations regain presence in India. Compassion International was the single largest donor to the nation of India, but has been severely restricted by the current administration in India. As a result, tens of thousands of Indian children have lost meals, medical care, and tuition payments previously provided by these organizations. President Trump can become a voice for these children, by demanding that restrictions be lifted on these non-profits. Send Vice President Pence to India to be a voice. In order to demonstrate US support for the millions of Christians facing persecution in India, President Trump can send VP Pence as a representative and an influence. VP Pence can meet with Christian leaders and leaders in the government to create publicity and show the US as a moral authority. While the Indian government may give “lip service” to being democratic and upholding religious freedom, there are powerful political and ideological forces at work that undermine the belief that all humans have a right to choose their faith and belief system. Vice President Pence can help show the legitimacy and urgency of this violation of human rights. Prioritize this crisis. Have this escalating persecution be a top priority of the new Ambassador-at-Large for International Religious Freedom, Governor Sam Brownback. His role is to promote religious freedom as a fundamental human right, and to help emerging democracies to implement religious freedom in their own nation. Let the crisis in India be one of Ambassador Brownback’s first priorities, as he works to promote this core value to see that people have the right to choose their own religious practices. However, the economic growth of India is largely influenced by trade relations with America. Recently, President Trump met with India’s prime minister to strengthen ties between the two nations. Trump should make a stand for religious as well as economic freedom. If President Trump chooses to put restrictions on trade deals with India in response to this crisis of religious persecution, India will be forced to respond—or President Kovind will lose favor with the people. Prayer: As well as interceding individually for the persecuted church in India, Christians can organize prayer meetings to intervene in the injustice done to the Christians in India. Sign this petition…along with your family, friends, and church members. There are millions of Christians in India today that are in danger of losing their lives because they do not have religious freedom. But this community doesn’t have a strong enough voice in the current government—in fact, they are seen as a threat to the national identity of India, even though Christianity has been in India for 1,000+ years. We want to raise awareness of this crisis and show support for the millions who are being robbed of their rights and security in India, but most importantly, we want to STOP the persecution in India. We encourage you to take an active step towards stopping the rapid increase of persecution and violation of human right in India, and sign the petition (CLICK HERE to sign petition)- which will bring this crisis to the immediate attention of President Trump, who can take effective action against persecution. Christians in India need to be advocated for, stood up for, defended, and seen. As a moral authority and world power, the United States has the power and influence to be a voice for the voiceless. When President Trump takes action against the violation of human rights on a mass scale, the crisis of persecution in India will shift and millions will regain their rights and their voice. The nation of India seeks unity among its people, but if native Christians continue to be persecuted, attacked, and threatened, the nation may not succeed. When Christian- and all religious minorities- in India are given true religious freedom, India will thrive. You can help stop the persecution. 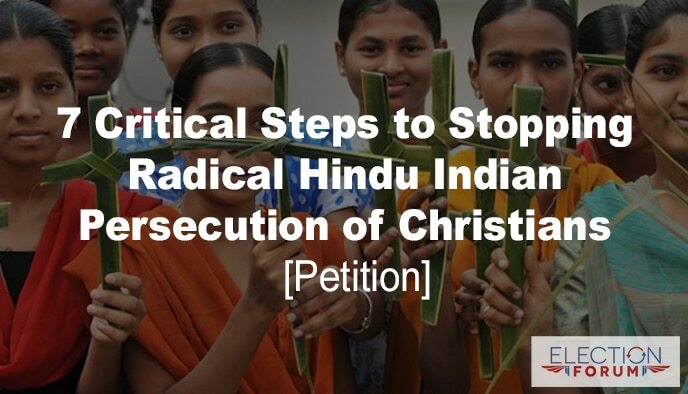 Help save the Christians in India and SIGN HERE. Your comments are, of course, things to be done. I cannot help but think of how Jesus would respond to what else is happening in that area. Do you think he would care any less about the killing of the Islamic minority in Mayamar . (spelling) If we are true followers of Jesus, we must care for those who are not like us. That is what he spent his earthly ministry doing.